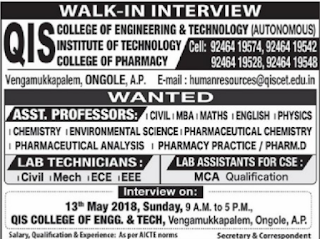 QIS Group of Institutions, Ongole has advertised in THE EENADU newspaper for recruitment of Assistant Professor jobs vacancies. Interested and eligible job aspirants are requested to attend interview on 13th May 2018.Check out further more details below. Name of the College : QIS College of Engineering &Technology,QIS Institute of Technology,QIS College of Pharmacy,Ongole. About College:The QIS College of Engineering and Technology was established in the year 1998, and sponsored by Sri Nidamanuri Educational Society to promote technological education to meet the requirements of a developing nation in the context of global concern at the threshold of the twenty first century.A team of educated, enlightened, experienced technocrats with vision, firmly determined to promote high quality education is striving to provide every facility for achieving excellence. The college is one of the best colleges in and around the Prakasam Dist. The Standards of teaching are very high when compared with the other colleges. The college is affiliated to the Jawaharlal Nehru Technological University, Kakinada. Interview Venue: Interview on May 13h ,2018,Sunday, 9a.m to 5p.m,QIS College of Engineering & Technology.Vengamukkapalem, Ongole,AP.